Built in the USA in 2010, the 190 foot yacht MI SUENO offers accommodations for 12 guests in staterooms. Published summer rates for Mediterranean yacht charters €325,000 per week in July and August and €280,000 per week in June and September. The owner of the newly-built 54.87 meter motor yacht HARBOUR ISLAND has lowered the yacht’s charter rates for her inaugural Mediterranean yacht charter season. Launched in late 2011, the Newcastle yacht HARBOUR ISLAND is available this summer at a rate of Euro 375,000 per week, plus all running expenses. Originally, the published rate was Euro 425,000 per week plus expenses. Custom built for her owner, yacht HARBOUR ISLAND offers a unique stateroom layout. The yacht features 2 king master suites (main deck and skylounge deck forward) and four guest cabins on the guest accommodation deck below, including a VIP king stateroom. Onboard amenities include a combination infinity pool Jacuzzi on the split-level sundeck, a raised “veranda” on the main aft deck, a private area Beach Club with easy access to the ocean, and an elevator that travels from the guest accommodation deck to the immense skylounge far above. With interior design by Claudette Bonville Associates and naval architecture credited to Murray & Associates, the yacht has drawn high praise and notice from the international yachting community. Current media attention includes the following magazine spreads. We are happy to plan your wonderful vacation for you. Simply contact 1-800 Yacht Charters at https://www.1800yachtcharters.com/book-now-contact-us/ today. The magnificent Çiragan Palace Kempinski in Istanbul was the setting for the annual gathering of superyacht owners and luminaries of the megayacht industry for the 2012 World Superyacht Awards. 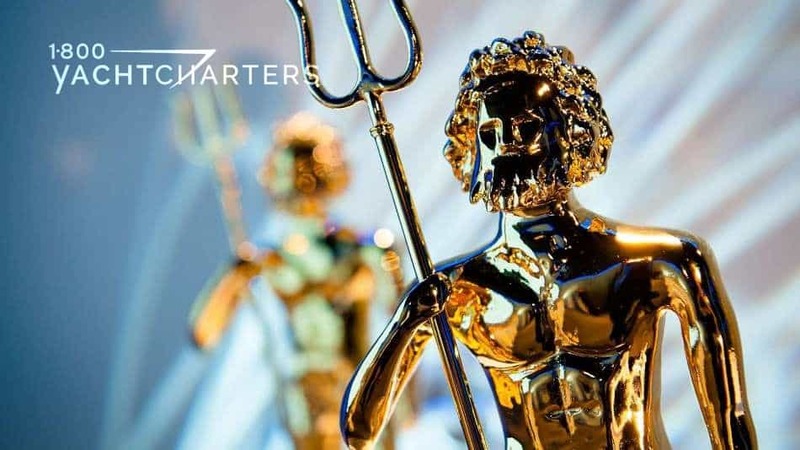 During a gala evening on May 5th, sixteen silver Neptunes were awarded to the finest sail and motor yachts delivered in 2011. Contact 1-800 Yacht Charters at https://www.1800yachtcharters.com/book-now-contact-us/ to reserve your yacht today! For years, travel agents and yacht charter brokers have promoted the British Virgin Islands as “Nature’s Little Secret.” Unfortunately for luxury sailing charter travelers seeking solace and quiet anchorages, the secret is out. While the BVI and most of the Caribbean remains a fantastic sailing destination, there’s no denying it – it is getting harder and harder to anchor off the shore of a quiet beach. The good news is that there are still undiscovered beaches in the Caribbean — blissful hideaways where tourism hasn’t yet eclipsed the local culture. 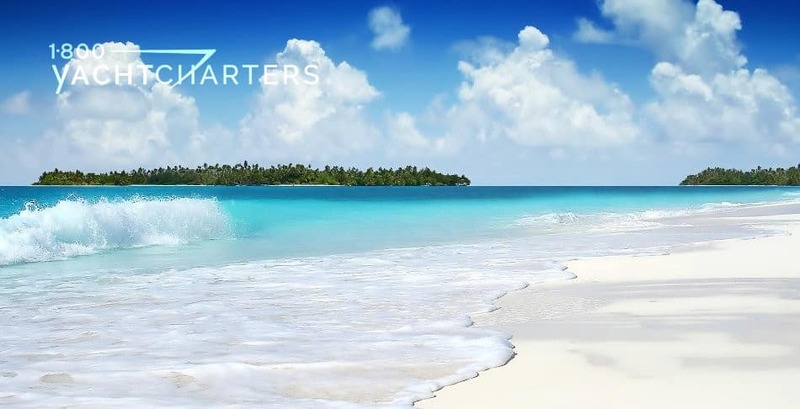 The most experienced Caribbean yacht charter skippers know these secret beaches but are reluctant to disclose their locations. Fortunately, our loyalties are to our charter clients – and we are more than willing to share these hidden gems with our readers! While the bareboat yacht charter crowd is anchored off the Baths in Virgin Gorda, BVI, we like slide across Drake Channel to the US side of the Virgin Islands and go ashore on the secluded southeast coast of St. John, at Lameshur Bay beach. At the end of the cobblestone beach at Lameshur is a more isolated, sandier strip known as Donkey Bight. Snorkelers love this beach, as it leads to Beehive Cove, a warren of caves and tunnels filled with coral and sea sponges and teaming with fish. Physical fitness buffs can also enjoy a 1.2 mile hike up a trail to the 1,000-foot peak of Bordeaux Mountain, which overlooks the bay below. 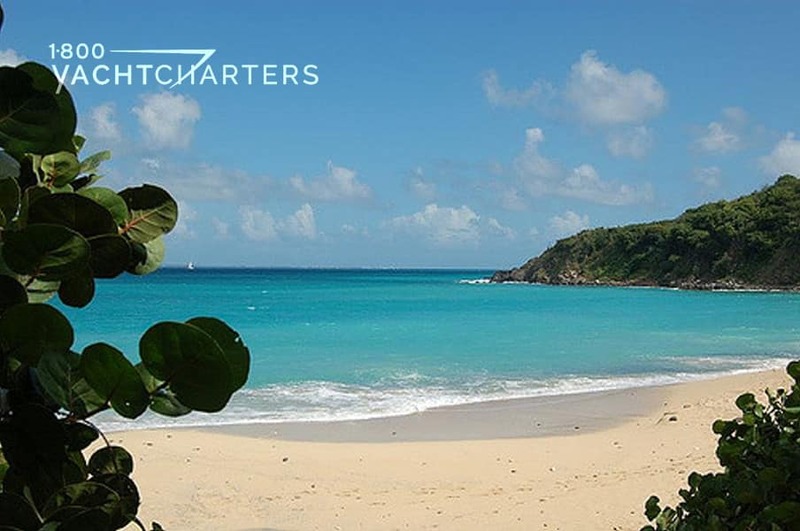 Located on the French side of St. Martin, Happy Bay is an underpopulated stretch of crème-colored sand. Thick underbrush surrounds the beach and serves as a challenging barrier to most shore-based tourists. The privacy of this beach has made it a popular spot for clothing optional tourists. Snorkelers marvel at the vast numbers of tropical fish in the crystal waters. The 70 meter Benetti motor yacht REVERIE has announced a deeply discounted rate for charters in May and early June – a savings of over 35%. 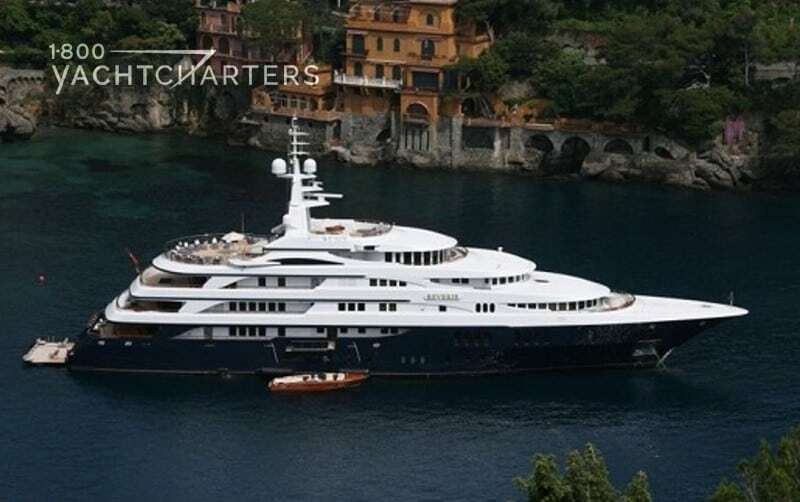 Waiving the regular weekly rate of € 550,000 EUROS, the massive superyacht has lowered her price to € 350,000 EUROS. Running expenses, such as food, fuel, bar and dockage are additional. Delivered in 2001 by Italy’s Benetti Yachts, the John Mumford-designed luxury yacht features seven decks, serviced by an elevator. 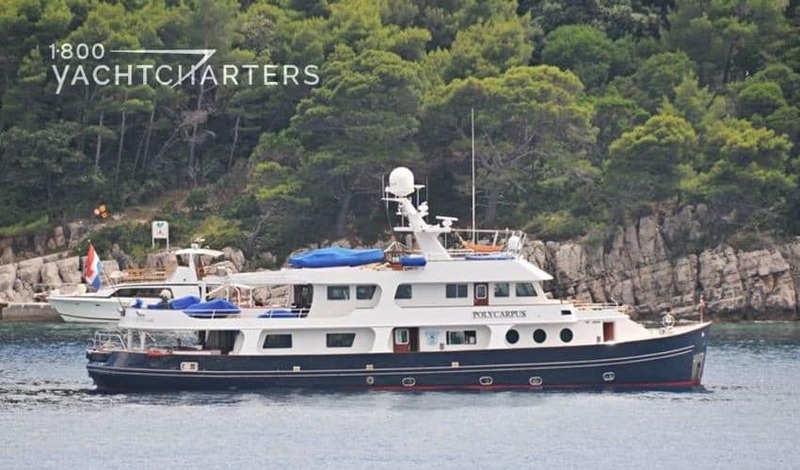 With accommodations for 12 passengers in 8 guest staterooms (plus a further 2 cabins for nannies or bodyguards) and 27 crew, this prestigious yacht offers great flexibility and outstanding service for any discerning charterer. Benetti yacht REVERIE is currently lying in Genoa, Italy, with two firm bookings. Looking for a unique destination for your summer yachting vacation? 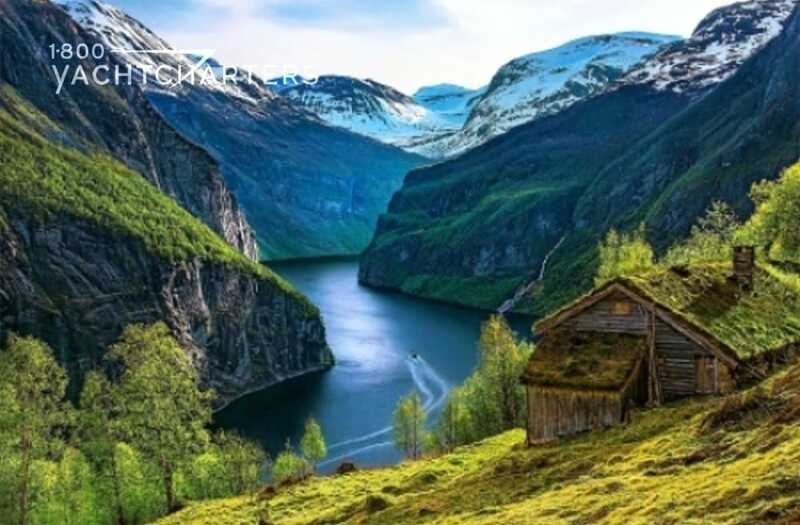 Try the fjords of Norway, selected by National Geographic as the top ecological tourist attraction. A handful of charter yachts will be available this summer to explore the stunning landscapes and dramatic scenery are found throughout this Scandinavian country.Motoryacht FOUR FRIENDS, an 80-foot Mangusta is scheduled to arrive in early July on Norway’s west coast – within easy cruising distance of the fjords. She offers accommodations for six guests at a base rate of €35,500 per week. For two week rentals, the owner will reduce the price by 10 per cent! Her base rate is now €2,000 per week. 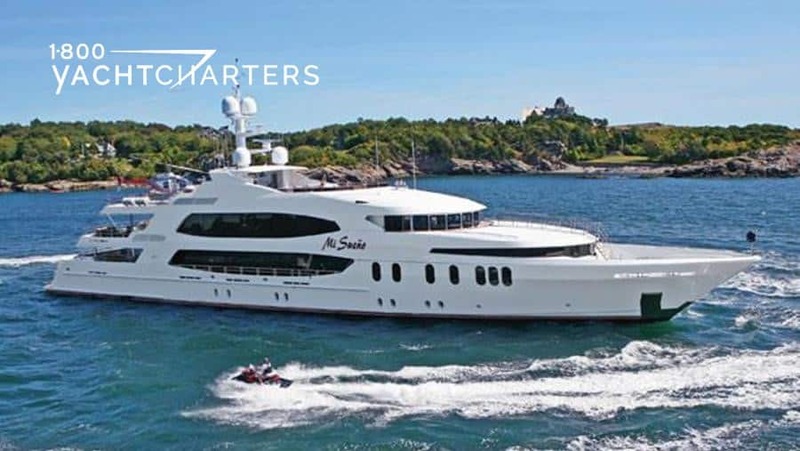 Beginning in May 2012, the 111-foot Christensen motoryacht CRISS C will travel to the Baltic Sea and Norway and will remain in the region all summer. She is a 10 guest yacht with prices starting at €49,000 per week. “We’re considering a New England yacht charter for this summer. Should we plan and budget to eat most dinners ashore at local hotspots and trendy restaurants? Dear Penny,There are many elements of a yachting holiday that make the overall experience memorable. First, a clean, luxurious yacht. Second, a professional crew. Third, a great destination, like New England. However, you’ll be happy to know that fourth, the meals and the total dining experience you can enjoy onboard will also be part of your lasting memories! 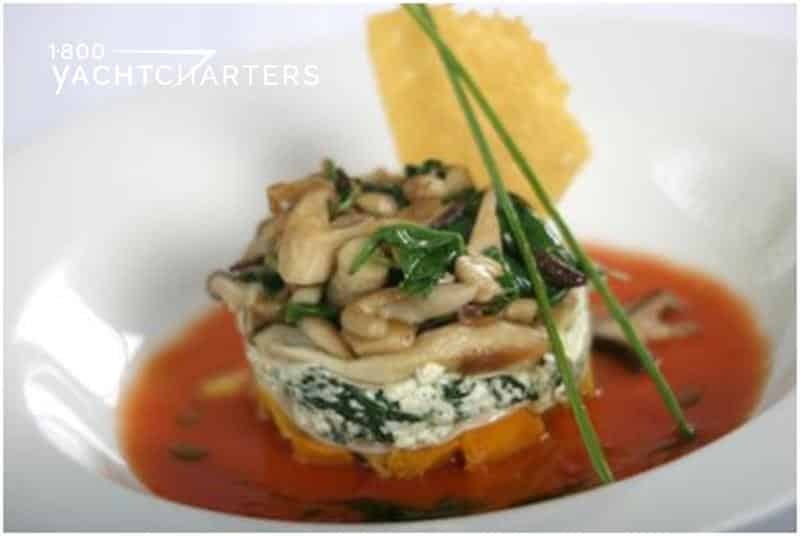 The chefs on most yachts rival the very best chefs around the world, and the meals they create are nothing short of amazing! Peter Williams, the executive chef onboard the 191-foot motor yacht CARPE DIEM was kind enough to pass along some samples from his galley. WHAT IF WE WANT TO EAT LIGHT? The choice is yours! You plan your menu with your chef. Vegetarian? No problem. Kosher? Absolutely. Low cholesterol? Certainly! You decide what you want to eat. If you decide to have the same delicious homemade pizza every night, it’s your choice! This is YOUR vacation! You can be as decadent as you want with menus and snacks. Your wish if your crewmembers’ command! HOW DO I PLAN MY YACHT CHARTER WITH YOU? Just call us at 1-800 Yacht Charters or contact us online at https://www.1800yachtcharters.com/book-now-contact-us/ TODAY! 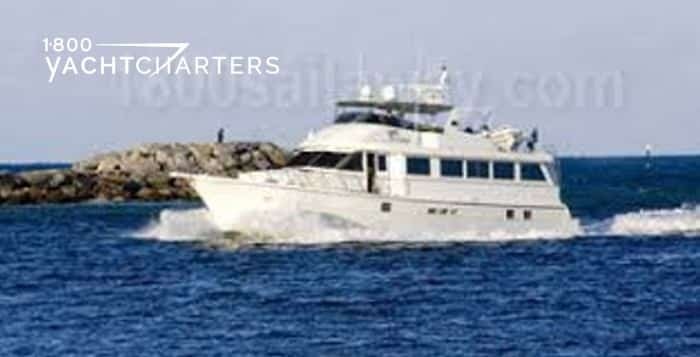 A 70 foot luxury yacht charter vessel needs to get from South Florida to Boston. 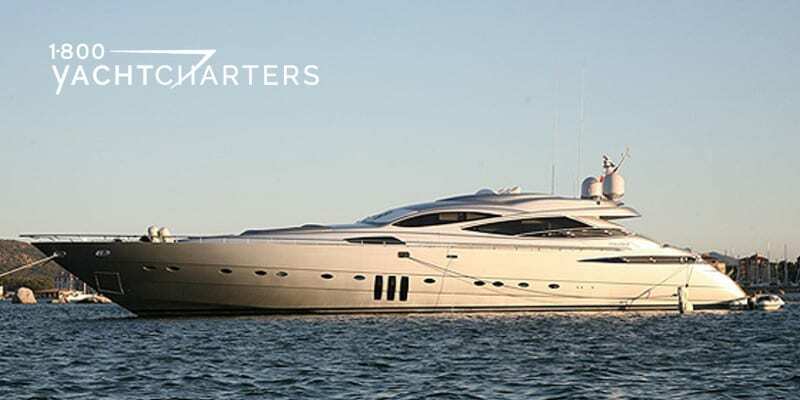 Join her for any leg of the journey and save 50% off the regular weekly charter rate.The owner of the Hatteras motor yacht EVY’S ANGEL wants to re-position his yacht to Boston for the summer, 2012. She’ll need to travel up the Atlantic seaboard, along the famous InterCoastal Waterway (ICW). Until the yacht reaches her final destination, the owner will rent his private yacht at an eye-popping reduced rate of 50% off. Motor yacht EVY’S ANGEL is normally available for charter at a price of $15,500 per week plus running expenses. That rate is now slashed in half to just $7,750 per week plus expenses. The ultraclean Hatteras has undergone continual refits and is in bristol condition. She accommodates up to 6 guests in 3 staterooms, all with ensuite bathrooms. This is the perfect opportunity to take a unique family vacation and see multiple ports! Come enjoy a week along the IntraCoastal Waterway ICW, anywhere from South Florida to Boston, Massachusetts. After a major refit in 2011, the Pershing 115 motor yacht MISTRAL 55 will be available for the first time as a charter yacht this summer, along the Italian Riviera. While there are many 35 meter yachts available for hire, few can offer the performance of a Pershing 115. Featuring twin 3,700hp MTU diesel engines linked to a 5,100hp Vericor TF 50 gas turbine, motor yacht MISTRAL 55 can reach an impressive top speed of 50 knots. Accommodations are offered for 8 guests in 1 master, 1 double, and 2 twin staterooms. Based in San Remo, Italy, this high-speed open yacht is available in the Mediterranean from € 70,000 per week in the low season and € 90,000 per week in the high season. In conclusion, have fun! Rent a private yacht in Italy. Contact 1-800 Yacht Charters at https://www.1800yachtcharters.com/book-now-contact-us/ today.